MC Elite Lacrosse provides opportunities for female athletes to elevate their game to the next level to become Elite players. We do this through a relentless focus on player development rigorous year-round training schedule, playing in the most competitive lacrosse leagues in the country, and competing in top-level recruiting tournaments. Our teams are for girls in 5th-11th grades. MC Elite practices in Potomac, Bethesda, and Rockville. Tryouts are every August. Our training programs focuses on conditioning, speed, and agility. We leverage MC Elite resources as well as widely respected partners. In addition to our rigourous team training, we offer programs to improve our player’s athleticism. We offer an instructor led running club, year round speed and agility programs through Healthy Baller, and individual stick skills development. Our development model includes a comprehensive approach to athleticism, individual skills, and developing a team oriented understanding of the game. We give our teams access to competition at the highest levels and the best coaches in the DC Metropolitan area. We provide a platform for the athlete to be seen and evaluated by college coaches. Our High School teams participate in IWCLA and other top recruiting tournaments competing against the best teams in the country. We provide recruiting seminars and assistance to the athlete in developing a comprehensive plan. Our high school coaches work with the players to set goals and help them achieve their dreams. Quality fields and facilities are hard to find in Montgomery County. We continue our partnership with the Stone Ridge School to provide convenient centralized facilities for our teams to practice and train. In addition to Stone Ridge, we are partnering with Georgetown Prep for our Winter training program. MC Elite is part of the MC Lacrosse family – which offers three programs, providing playing opportunities for girls of all skills and abilities – from elementary school to high school. MC Lacrosse’s philosophy is to offer a skill appropriate place for the athlete to develop whether its Youth, Select, or at the Elite level. We want the athlete to develop at their pace and to develop a lasting love of the game. We offer continuity between all levels so the girls progress successfully through each stage of growth and development. We are committed to developing our players. Our training programs are second to none. We provide year-round team practices, play days against the top area clubs, access to the best leagues and tournaments, guest coaches, and individual programs to develop tactics, conditioning, speed and agility. Our development model is designed to develop athleticism and skill. It is not about the wins it is about getting better, so to do that, teams have a robust tournament schedule in the fall and summer. We want our players to achieve their goals. Whether that’s to play for the high school team, or to be recruited by a Division 1 lacrosse program. Our program is designed so the girls can achieve their goals. We provide a platform for our players to develop, demonstrate their abilities, as well as achieve both individual and team success. 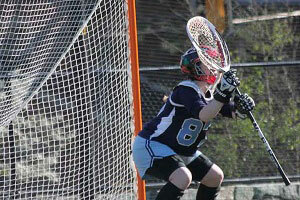 Teams have the opportunity to achieve lacrosse success throughout the year via play days, leagues, and tournaments. MC Elite Lacrosse is committed to making lacrosse accessible to all girls regardless of financial means. Please consider making a donation to our scholarship fund to help assist families in need.